It’s been a while since Greece’s media and political parties paid any attention to Golden Dawn. That changed on Monday, when the neo-Nazi party’s spokesman and MP Ilias Kassidiaris allegedly shoved New Democracy MP Nikos Dendias and launched a verbal assault on the public order minister after he walked in front of the Golden Dawn lawmaker while the latter was speaking in Parliament. The incident led to all of the far-right party’s MPs being expelled from the session, during which MPs were debating the multi-bill of measures submitted by the government on Saturday night. The episode lasted just a few minutes but presented us with a useful snapshot of Greek political life. Firstly, one of the most memorable moments of the brief exchange was the speaker repeatedly calling for the Parliament’s guards to enter the room and eject Kasidiaris. The word “guard” must have been shouted at least a dozen times during the two to three minutes, but nobody arrived. If a symbol of the decay of public institutions in Greece was needed, there it was. In the very “temple of democracy,” the means or willingness to uphold certain safeguards was absent. Should we be surprised, though, that the guards seemed to be caught napping when the political parties themselves have shown an indifference towards dealing decisively with Golden Dawn for years? Apart from a brief moment of unity in late 2013, when 235 MPs voted in favour of cutting off state funding to the extremist party, there has been no coordinated or concerted attempt to confront this menace to democracy and the lives of Greeks and migrants living in Greece. The previous two observations combine into one when examining the way in which the trial of Golden Dawn members for the murder of rapper Pavlos Fyssas and several other attacks has progressed since arrests were made four years ago. The case has only inched forward following arguments about where it should be held, fights in the courtroom, a lengthy strike by lawyers over changes to their social security contributions and numerous adjournments. While there are many things that are particular to the Golden Dawn trial, there is one aspect that it has in common with most court cases in Greece, which is the decrepit state of the Greek justice system. A surfeit of laws, a dearth of judicial officials, a lack of facilities and a backlog of cases mean that justice in Greece is in a precarious state. It is an indictment of all the recent Greek governments that the country’s justice system has worsened rather than improved during the crisis. This is also a stain on the programmes agreed with Greece’s lenders since 2010. The final observation to make about Monday’s incident has to do with the absurd reaction from New Democracy. Rather than use the moment to show that the pledge made by its leader Kyriakos Mitsotakis to be a unifying force is genuine, the conservatives decided Kasidiaris’s belligerence provided a suitable opportunity to take a cheap shot at SYRIZA. Almost as if there was a coordinated effort, journalists sympathetic to New Democracy’s cause and the party’s obstreperous vice president Adonis Georgiadis suggested that the whole incident had been staged in order to deflect attention from the discussion about the onerous measures included in the multi-bill. Georgiadis went as far as claiming that there is a “secret alliance” between SYRIZA and Golden Dawn. New Democracy later issued a statement claiming that Golden Dawn is “facilitating” SYRIZA. This is dangerous ground for the opposition party to stray onto. Firstly, New Democracy is the only party whose officials have been proved to have had secret contacts with Golden Dawn. This is what led to the then cabinet secretary Takis Baltakos resigning in April 2014. Also, Georgiadis was a leading member of ultra-nationalist LAOS, a political forerunner for Golden Dawn in some ways, until 2012 and only recently apologised for “sharing and tolerating” anti-Semitic views as part of his efforts to absolve himself of his past sins. It is also patently preposterous for New Democracy to suggest that Greeks will suddenly forget about plans to implement almost 5 billion euros in new measures between now and 2021 (a fact that they are reminded of by the front page of every newspaper, home page of every news website and TV and radio bulletin around-the-clock) because of a skirmish in Parliament. The danger for New Democracy is that it becomes a specialist in ridiculousness as it tries to unseat the government. Mitsotakis has already put his credibility at risk by calling for snap elections on a regular basis. Recently, he has attempted to cast himself in the image of Emmanuel Macron, suggesting that they share a moderate, reformist approach and a dedication to truth-telling. “The proponents of realism, reason and cooperation are back,” he tweeted after Macron’s victory over Marine Le Pen. It would be a more believable comparison had Mitsotakis not tried to ride the coattails of failed conservative candidate Francois Fillon only a few months earlier. “We are united by the struggle against populism (and the fact that we share a birthday),” Mitsotakis had tweeted after Fillon won his party’s candidacy last November. It might have carried some plausibility if Mitsotakis backed up his reformist rhetoric. He continues to call for tax cuts (which is a policy even the SYRIZA-led government advocates) without specifying where the commensurate savings will come from, apart from non-credible claims of reducing waste in the public sector. He claims he will renegotiate fiscal targets with the lenders if he becomes prime minister even though this strategy failed when attempted by Antonis Samaras in 2012 and Alexis Tsipras in 2015. Mitsotakis’s claims of wanting to lead a liberal revolution also sit uncomfortably with his recent pledge not to pursue the separation of the Church and state and to presumably leave the Church of Greece’s role untouched. 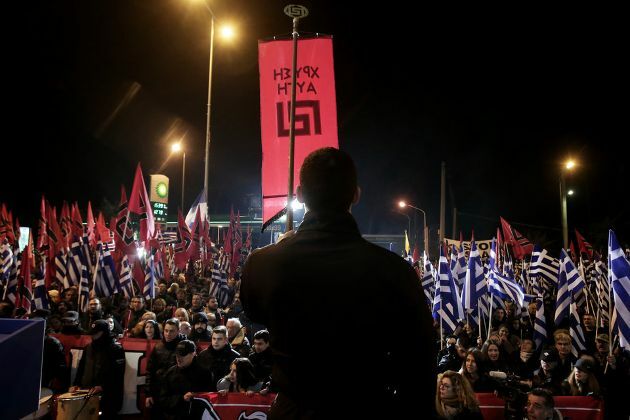 Whether it is New Democracy’s hypocrisy, the weakness of Greece institutions or the lack of political unity on even the most pernicious of threats, what has become obvious is that Golden Dawn is not a political outlier but a reflection of the country’s failed politics. What we saw in the mirror this week was a particularly ugly sight.